Providing opportunities for students to engage in meaning-making discussions that build on prior knowledge and promote divergent thinking, is key to helping them develop deep understandings about the natural world. Actively engaging students in conversations about their ideas builds their capacity to reason scientifically and validates their contribution to group knowledge. For the instructor, facilitating productive talk about interesting organisms and intriguing phenomena can provide a window into student thinking, as well as stimulating their curiosity about student ideas and sharing a fascination with world around us. 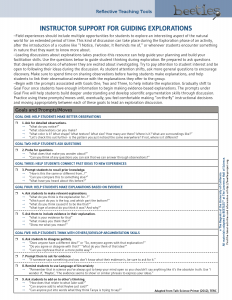 These resources provide ideas, planning tools and teaching routines to help instructors developing the skills required to lead productive, meaning-making discussions. 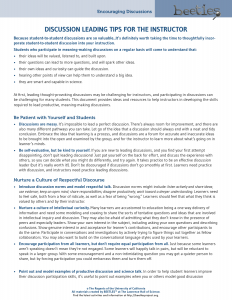 A list of suggestions and important considerations for leading discussions. A short list of “best friend forever” questions that can be used in many situations to facilitate exploration, observation and discussion. 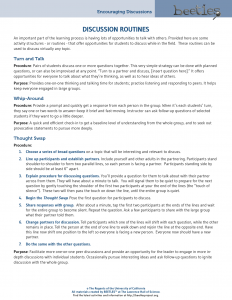 Short descriptions of various routines to encourage student-to-student conversations. 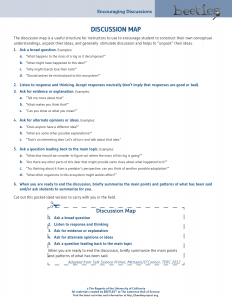 A flexible tool for structuring open-ended discussions. 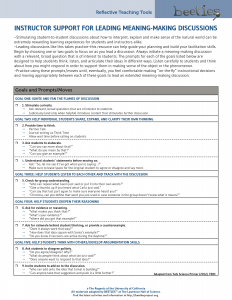 A list of suggested prompts for building student skills in participating in meaning-making discussions about the natural world.